Communicating with your customers starts with eye-catching dynamic design. Whether you're starting from scratch or want to boost your current image. 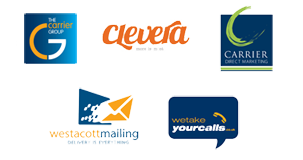 As part of The Carrier Group, Westacott Mailing works with Clevera to provide full-service design consultancy. From logos to letterheads, brochures to billboards, Clevera can work seamlessly with your company to provide supporting products, stand alone design work, or a combination of the two. If you're working on a mailing campaign and want to move your productions into a digital format, Clevera can handle that. If you're just starting out and need a website, we've got you covered. Contact Clevera about our full range of services, or talk to your Account Manager.